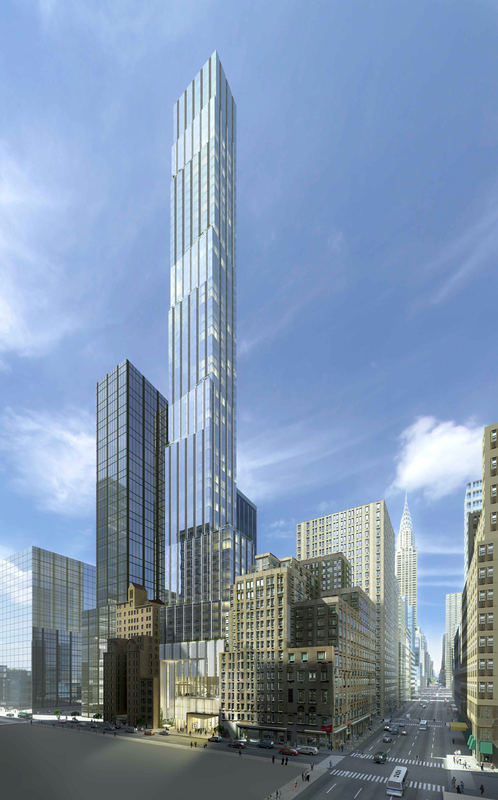 Back in 2014, we reported on permits for a new 52-story hotel at 138 East 50th Street, between Lexington and Third Avenues in Midtown East. YIMBY can now reveal the latest plans for the site, which have changed significantly, and the entirety of the building above the retail base will be condominiums. 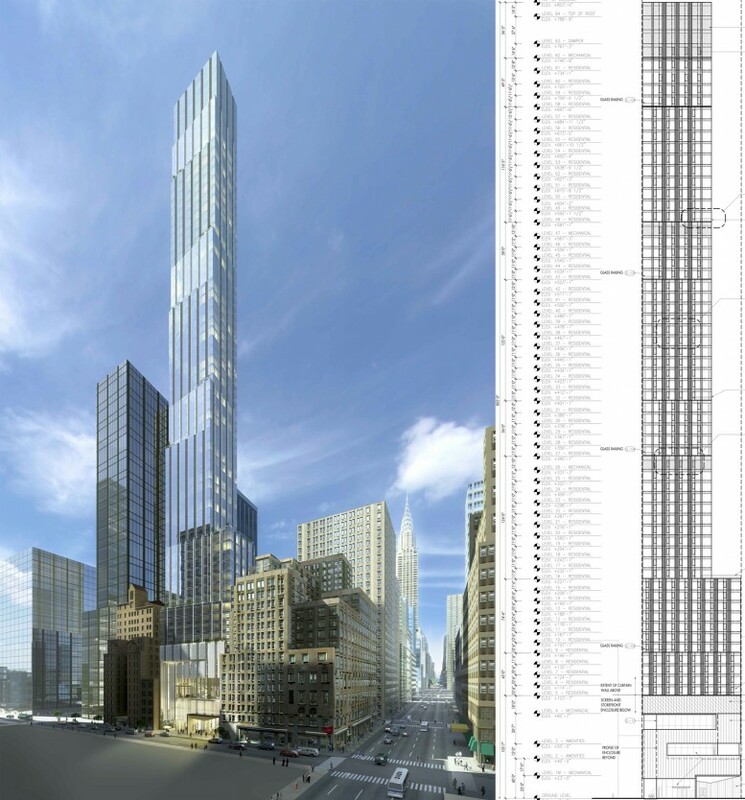 The project has also received a significant height boost, and is now slated to stand 64 stories and 803 feet tall, with Pelli Clarke Pelli serving as the design architect. Last year, Extell sold the site to Cerruzzi for an undisclosed amount after picking it up for $61 million in 2012. The original applications filed with the Department of Buildings called for 764 hotel rooms spread over 220,000 square feet, as well as a 7,000 square foot retail component. Before the 2000s supertall boom, the plans for 138 East 50th Street would’ve ranked among the tallest residential buildings in New York City. Now, the project registers well below the supertalls lining 57th Street and rising across the Far West Side, and stands roughly level with some of the area’s larger office blocks, like Citi and MetLife. Residential towers in the 700-1,000 foot range are becoming an increasingly common sight across several neighborhoods in Manhattan, but Midtown East in particular should be prone to rapid densification once the rezoning is finalized, especially if it encourages mixed-use development. Ceruzzi is quickly becoming a force in Manhattan’s current boom, and the firm is also behind plans for a 920-foot-tall tower at 520 Fifth Avenue (on the corner of 43rd Street), as well as 1289 Lexington Avenue, revealed by YIMBY earlier this year. While the side-streets of Midtown East aren’t normally prone to particularly attractive designs, a building of this scope — which is kind of tall, even for Midtown standards — merits some consideration. Per the plans, the exterior of the first few floors will be wrapped in a “terra cotta screen wall with integrated louvers,” and the building’s amenities will be co-located within the base as well. Upper floors appear significantly glassier, though a series of staggered setbacks and louvers in the facade will ensure the tower avoids anonymity. Floor heights start at 10’6″ on the lower levels before increasing to the 11-12′ range on the mid-levels, and rising further to 13’6″ on one of the penthouse floors. While the documents do not come with a unit count, the best comparison is probably 100 East 53rd Street, which will be similarly sized both in terms of square footage and height. That building breaks down to 91 condos averaging 2,700 square feet apiece and will stand just over 700 feet to its roof, likely offering a good approximation for the breakdown 138 East 50th Street will offer — though its location three blocks south means units will probably be a bit somewhat smaller on average. No completion date has been announced and current applications filed with the DOB reflect the old hotel project.